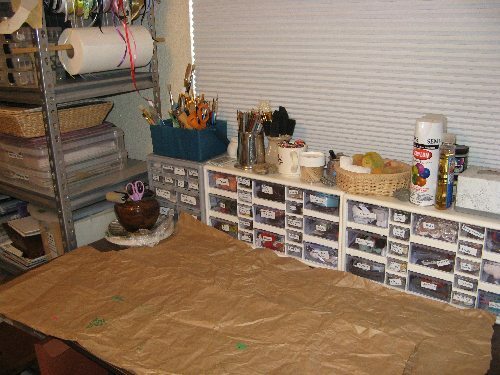 Part of my frustration with my studio was not having any open space on my worktable. The magazines and books I’ve been reading for inspiration over the last few years often show pictures of art tables with interesting antique containers used to hold and display a variety of supplies. I like the idea of getting to use unique and interesting containers this way, so I’ve been collecting jars, bottles, and other containers I like from the local thrift stores and using them to hold brushes, pens, scissors, glue, and anything else I thought should be available for use. The only problem was that all those containers were taking up a lot of space. My lightbulb moment was realizing I didn’t have to have all those supplies within reach all the time. I just needed to be able to get to them when I needed to get to them. So I decided to move most of the supplies off the table and into storage on my shelves, in containers that could be set on the work table for easy access when I actually needed those supplies. For example, I put all my markers and pens into wooden silverware trays which stack nicely on the shelf, are easy to bring over to the table, and store the pens horizontally, which is supposed to be better for them anyway. 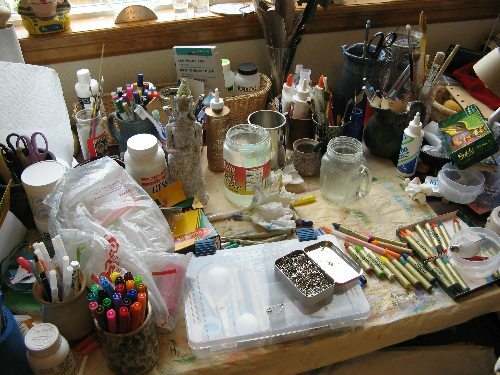 I also had six jars of brushes, sorted by size/use, sitting on my table. I got them all into a single container that maintained the categories while taking up a lot less space. I still have one jar of colored pencils and one of crayons on my table, and some pencils in with my brushes, but gel pens, markers, Sharpies, etc., are all in the trays. Moving my pens and other supplies onto shelves gave me the space I was looking for. The few jars and baskets I still have now sit on top of the drawers that hold my “embellishments” – bits and pieces that I want to use in my art but often haven’t. Now that they will be in my line of sight while I am working, I expect I will make much better use of them. The drawers line the back of the table, taking up only some of the space that all my supply storage used to, so I still have more table space than I did before. Tomorrow: My favorite storage container. Studio Makeover: My Favorite Container and What’s Next?